My Home Kitchen - My Pride, My Shangri-La! In this article, I am going to talk to you about interior design... more specifically - about my kitchen! My kitchen is my favourite room (in my home). When I moved into my house in December 2011, the house was old, dated, and had the most horrendous extension (which housed the kitchen) at the back of it. My brother and I lived with said extension for about three years before I, finally, came up with a design for a new extension that worked (and which I liked). Thanks to my job as an Architectural Technologist, I drew up the plans for the extension, myself (with some assistance from my dad), got them passed through the Building Regulations department, and then designed the interior with a kitchen company that we (my dad and I) have used, before. I had so much fun designing my kitchen, and - knowing now how it looks and how it worked out - my kitchen design is easily one of the highlights of my career. I had decided that I wanted my kitchen to be light, bright, and a vast space. However, due to the extension only being 2.8 meters deep (and the width being the width of the back of the house), this wasn’t a simple task... I achieved it by making sure that I had a vaulted ceiling with Velux windows in, as opposed to a suspended ceiling - this makes all the difference in the world! I had the ceiling painted white, which also helps to make the ceiling seem higher than it is, thus making the room feel a lot bigger, too. The old layout meant that there was a very high window in my dining room, looking out into a very small conservatory at the back of the house – off the side of the kitchen extension. 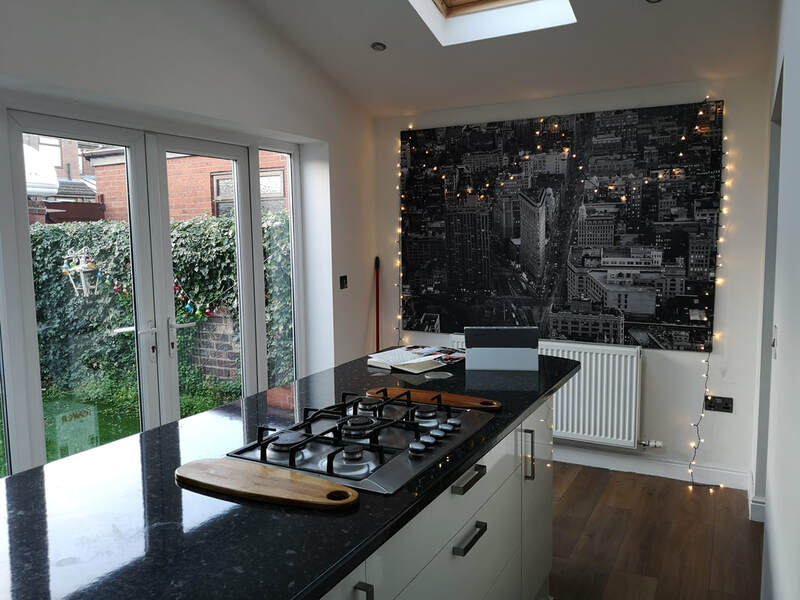 The conservatory was demolished with the extension, and the window was taken out and replaced with double doors, which now means that you can see all the way - from the living room, through the dining room into the kitchen, and out into the garden. This not only makes the kitchen feel bigger, but makes the house seem much longer than it is. The layout is almost an “open concept” since I usually have all of the doors kept open. I then had double French doors added to the extension that leads out into the garden – again, bringing in lots of light and allowing the room to seem bigger than it is. 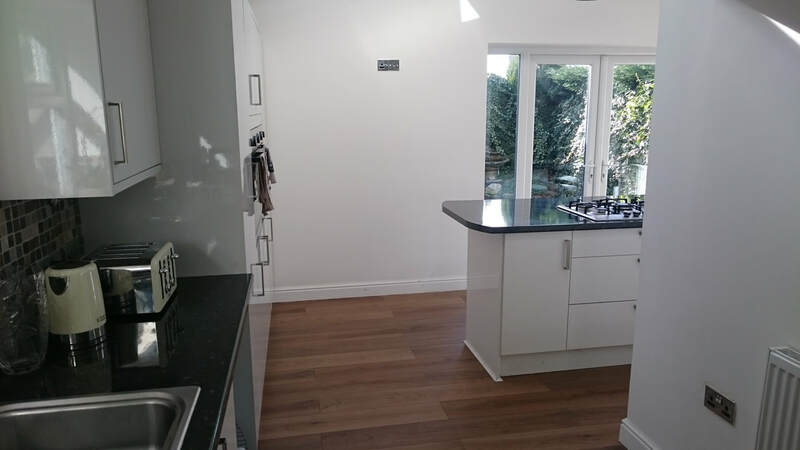 The kitchen layout is in an L-shape - using part of the existing kitchen while combined with the extension. The ceiling in the existing part of the kitchen is 2.4 meters high, transforming into a vaulted ceiling in the extension and providing a pretty big WOW factor (in my humble opinion! ), if you enter the house from the front; however, the house is usually entered into from the rear (due to car parking reasons). As I keep mentioning - this extension was all about space and about giving the illusion that the area is bigger than it actually is. I achieved this, not only with the initial design of the extension, but also with the design of the wall (plus - the colors and the kitchen layout). 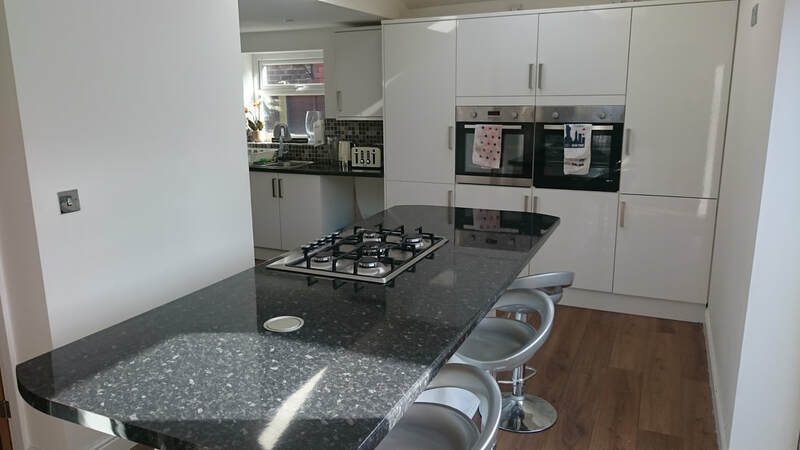 I opted for off-white walls, combined with white units and black worktops and an island in the middle of my kitchen... these were absolute musts for me, and I ended up building not only my interior layout, but also the entire extension around the island. The existing kitchen consists of - worktop space for my kettle, microwave and toaster, along with my sink and a cupboard (underneath). My washing machine & dryer are also located in this part of the kitchen. 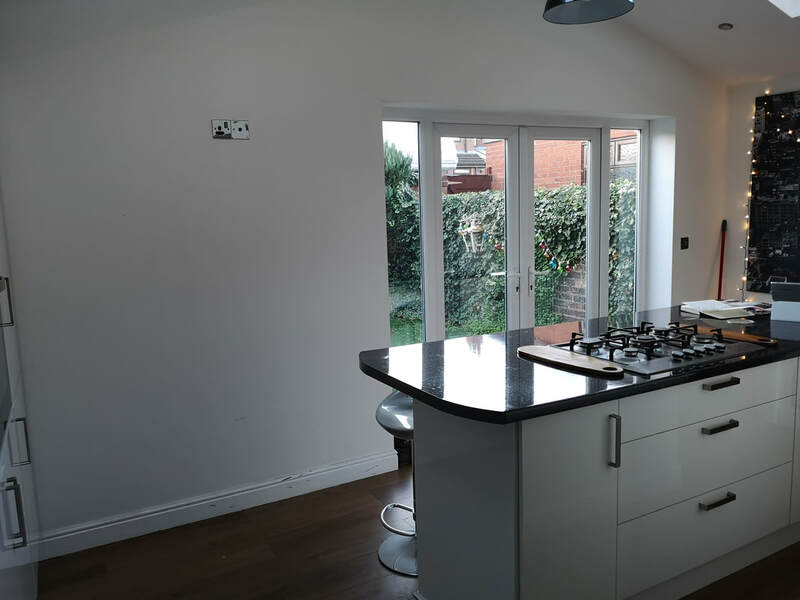 The extension consists of a larder cupboard, two ovens, four smaller cupboards, a hidden fridge-freezer, and an island that houses two cupboards, three drawers, and the gas hobs on the surface. There is not a single bit of color in my kitchen… everything is black, white or grey/silver! Even my huge canvas of New York City on the gable end of my extension is black & white. I really like it, that way, but I have recently considered throwing a splash of “duck egg” blue in there. I know the saying that goes - “the kitchen is the heart of a home”; and, there is nothing truer in my home. If you saw my last post on here, you will know that I like to host a party or two; and, my kitchen is usually where the parties start and end. It’s the room that everyone loves to be in, the room that everyone seems to enjoy themselves the most in… and, I couldn’t love it more, if I tried! When my brother and his now wife decided that they wanted to move back to our hometown, I was devastated at the prospect of having to sell the house…. but, luckily for me, I was able to secure a mortgage on the place, and my relief about this mainly arose from the fact that I didn’t want to leave my kitchen! I, honestly, can’t imagine myself living anywhere else! 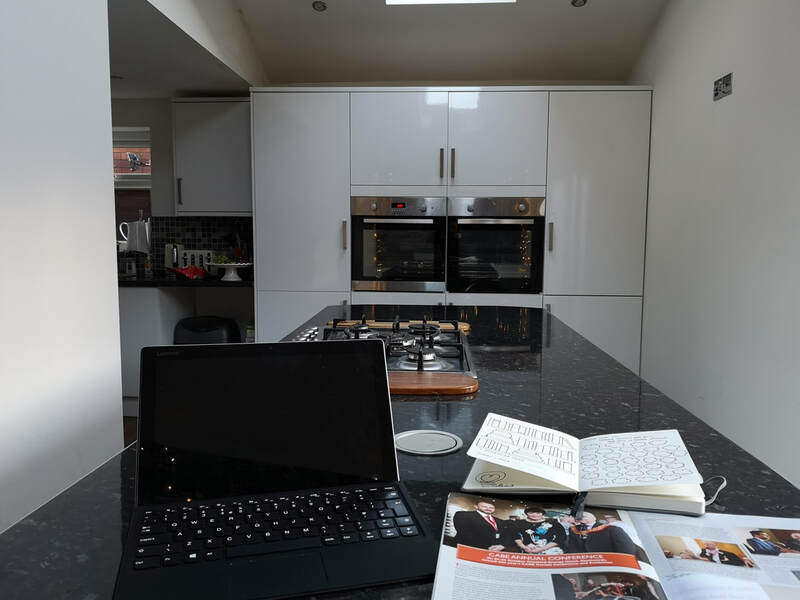 My kitchen is where I cook, clean, blog, read, party… it’s the place where I spend most of my life when I’m not at work or in bed. And, I couldn’t be happier about it! Hey everyone! My name is Stephanie Barraclough (“Steph” to my friends), and I’m a 28-year-old Architectural Technologist (with a specific interest in Design) from Wigan (Greater Manchester), England. I’m based in the construction industry, and have a degree in Building Surveying, along with a degree in Architectural Technology. My passion lies within the sphere of Interior Design, but I also have a big place in my heart for Architecture. When I’m not working, I love going to the cinema (to check out the latest movies), reading, traveling, cooking, and spending as much time as I possibly can with my friends and family. I have an obsession with superheroes, DVDs, and a wide variety of books! Also - I love nothing more than a glass of wine or Prosecco during the weekend whilst I enjoy Chinese or Italian food (which happen to be my favorite types of cuisine). I started blogging in September, 2017. I felt that I had stories and experiences, which I wanted to share with people; blogging was something that I had considered doing for a long time... I just hadn't been brave enough to do it until recently, in that I was worried that my posts would never be read, or that they (my posts) wouldn't be good enough in some way. Right now, I'm really enjoying my blogging, and I'm pleasantly surprised at how much appreciation my blog posts are receiving! I’m basically a lifestyle and travel blogger, but I like to cover fashion and health/well-being, too, as I tell you stories of my adventures, my other past experiences, and such things. I’d describe myself as a pretty happy person who enjoys the simple things in life whilst also seeking out extraordinary things whenever possible. As far as sports and fitness are concerned - I especially love watching rugby, basketball, and ice hockey. And, I enjoy partaking in yoga and swimming; yoga is a relatively new thing for me, but swimming is something that I've always enjoyed. I'm usually one of the first people into the pool whenever we’re on holiday! After learning about Ovasinax, I do feel that this would be a really exciting game to play and compete in, and I’d love to give it a go, someday! In any case, I’m really looking forward to this amazing opportunity to share my thoughts and experiences with you via regular postings on this page. I hope that you all will truly enjoy my writings and pictures!